I was kindly invited to the Content and Development Team's offices (part of LRS who are located in Plymouth University's Library) yesterday to watch the live webinar from EDUCAUSE entitled 'Library in Your Pocket: Strategies and Techniques for Developing Successful Mobile Services '. Developed by David Woodbury & Jason Casden from North Carolina State University, it was essentially a very clever Big Brother meets the Library set of resources designed for web enabled mobile devices such as Palm, Android and of course iPhone. Included was the means for students to search for available computers, view live webcam feeds and search for library stocks ('available only' to reduce seaching time) all from the comfort of their phones. The webcam feed is one of the better ones I've seen for a while on a mobile device, almost lifelike for a small output, and one of the more popular elements used. All in all a rather well thought out and excellently devised set of tools. The computer availability option is a great idea. If there was a wish list I think it would be rather good to include details about what software is available on each PC, so students could search specifically for the applications they would most want to use. Otherwise I would envisage some students getting a free PC logging in and not finding the software they wanted. If you would like to watch this again, its already available on the EUCAUSE site. 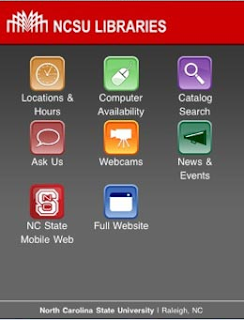 Further details on tha NCSU Libraries Mobile site.